Despite her tragic end, Sweden is quite proud of this ship. They rose her from the depths of the sea and turned her into a museum. My husband and I spent Saturday walking around and learning all about her. The museum consists mainly of the giant ship in all her glory. One sign said they used 95% original material to restore her. A video we watched said it was 98%. Either way, it’s impressive. The statues and carvings alone are enough to make any art lover drool. If you’re interested in the details, the wall behind the sterncastle is filled with examples, along with explanations of why each statue was chosen and what it represented to the enemies of Sweden. Which I honestly question. As an enemy, I’m not sure I’d be leaning over the deck of another ship, squinting into the sunlight, saying, ‘Uh-oh, see that mermaid carving there? You know what that means. Turn the ship around! Turn her around, I say!’ The ship’s size and firepower would be enough to convince me to leave her alone. Carvings of snakes coming out of Hercules’s nose wouldn’t be necessary. Small exhibitions spread out over four separate stories around the ship give you a view of the tragic vessel at every level. While she looms in the background you can learn about life as a seaman in the 1600’s, see the memorial for those lost at sea that day, including two rows of skeletons preserved in glass exhibition cases (personally, I thought it was kind of creepy to walk around looking at skeletons. 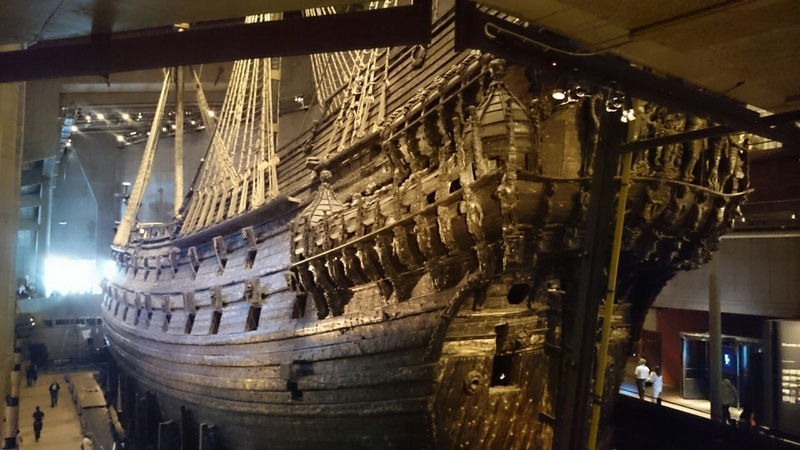 I’m a wimp, but others might go for that), read about how they determined the painting scheme for the ship, and walk onto a mock deck built for tourists. Every half hour or so you could watch an informational video which explained the salvage efforts. In another room, they played back an audio mock inquest where Stockholm demanded to know what had gone wrong. The voice actors sounded not-so-Swedish and very British. A wall map, crowded with flags and ships of varying sizes, displayed naval forces of the day. And several exhibitions throughout the museum tried to explain ballast and why the concept was particularly important in this case. 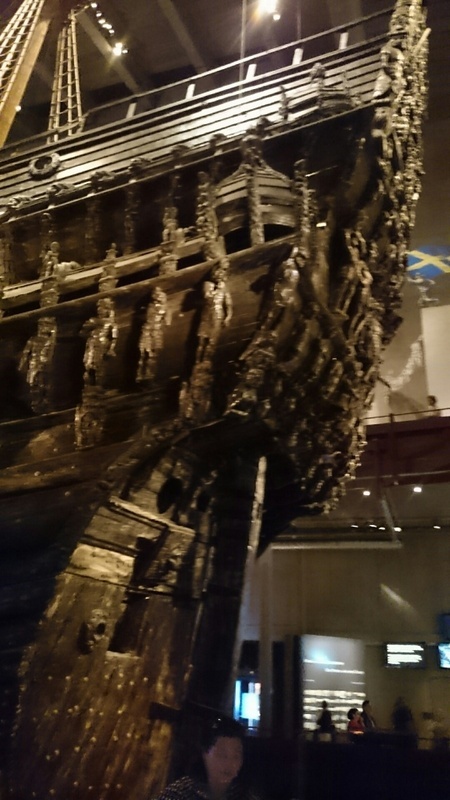 The Vasa had a narrow bottom which meant once the ballast was loaded, it still wasn’t enough to keep the top-heavy vessel (with two gun decks) upright under any wind, or general breathing from the public. If I had to pick my favorite exhibition, I would choose the display that showed life on the various decks. 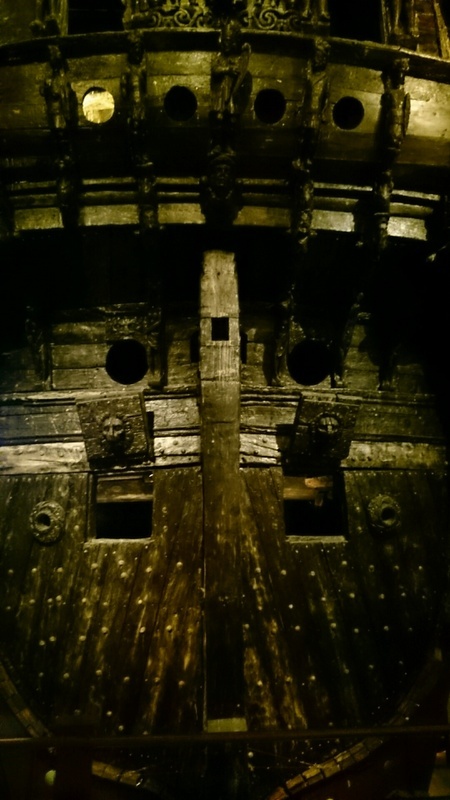 It’s extremely helpful for me as an author should I ever want to recreate a situation onboard a ship like the Vasa. I also enjoyed the look back in time. I saw square coins and wondered why I hadn’t thought to use them in any of my stories. I saw the contents of a seaman’s chest and marveled at the D.I.Y nature we seem to have forgotten. Soles to repair shoes, along with small tools and leather patches. Why do we assume everyone went out and bought a new pair of boots every time they needed something? It’s hard to remember capitalism wasn’t the name of the game way back when and people fixed broken things. I loved the cannon exhibition and the mock battle area. Talk about a writer’s paradise! Different types of cannon shot and when to use each one is instant fodder. I’ve seen cannons at Fort Sumter, pointing towards Charleston, and the ones at White Point (fun fact, I was so taken with White Point, I put a town bearing the same name in my novel) pointing back towards the Fort. I’ve also boarded the ship touted as a mockup of the Black Pearl off the California coast. 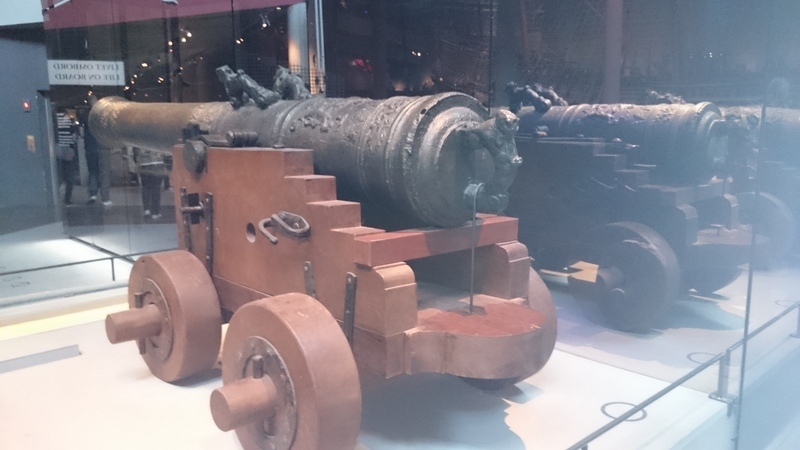 But this was the first time I’d seen so many ship cannons up close. I especially loved the lion’s head adornment on the hatches. I added that lovely detail into my story two days ago. Perhaps the best part of the trip was realizing how impressive this ship, and others like her, are. When you stand next to her and keep looking up . . . and up . . . and up. 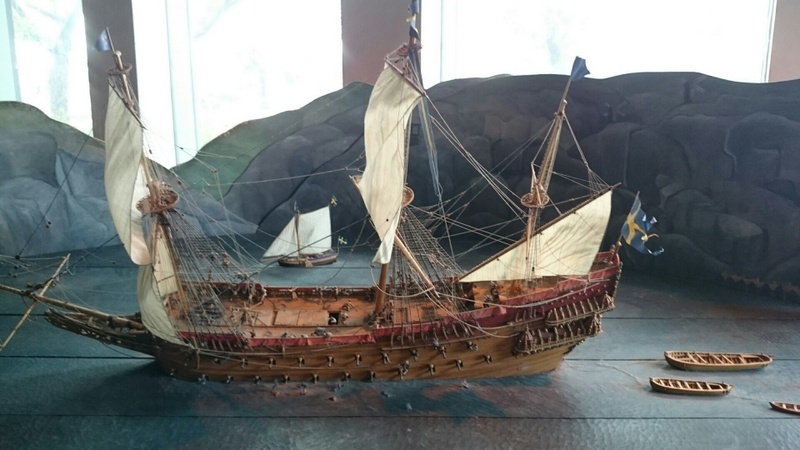 I probably couldn’t even lift one tiny plank and here is this massive ship with all the individual parts lovingly carved, or painted, or sealed together. And there I am, like a tiny barnacle staring up in wonder beside her — my shadow swallowed effortlessly by hers. As with most excursions, I like to take home a souvenir. I know it’s cheesy, but I like mementos. The gift shop carried typical tourist fare. Postcards and shot glasses. Feather pens, which would have been so much cooler if they were authentic feather quill pens. Kitchen towels adorned with the Vasa (I’ve never understood that tourist fascination . . . ). Magnets. Books (some of which I’d love to buy should they ever come down about 50% on the price). T-shirts. 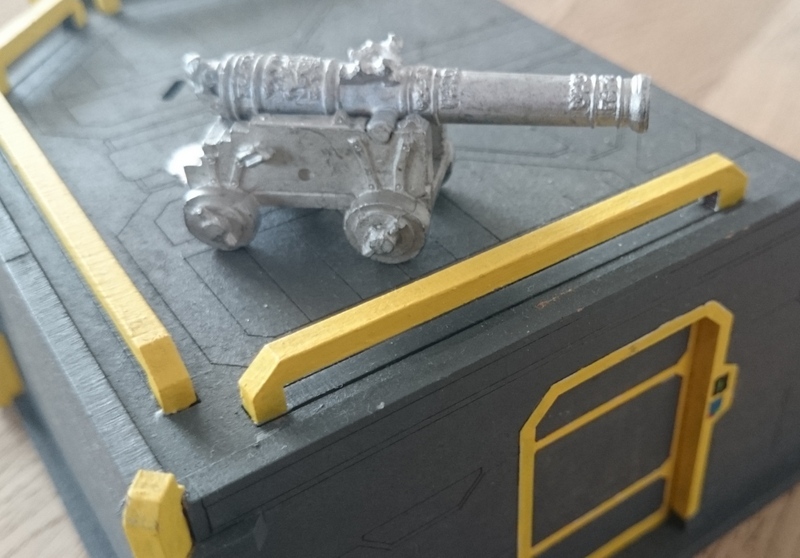 All fantastic choices (with the exception of the kitchen towels), but I went with a small cannon. It seemed fitting somehow. The bunker it’s sitting on is my husband’s. He paints these little people and takes them to war. Sometimes he makes boxes. Sometimes I borrow them and play with them while he’s at work (shh!). We had a great day walking around an interesting museum filled with enough inspiration to keep writers captivated long after the visit is over. Afterward, we ate lunch at a small garden café called Villa Godthem in the park across the street. If you’re ever in Stockholm, I highly recommend both the museum and the café.